Are you thinking about buying or leasing a home in Houston? Or are you looking for answers to your questions on the Houston housing market? Hunter agents also work in Houston’s many suburbs, planned communities and new home developments. All you need to know about moving to and living in Houston is right here. You’ll find valuable resources on selling, buying, and all things connected to Houston real estate. You’ll find listings of some of the most desirable homes in the area, as well as related tips and updates. Feel free to explore the site! Hunter Real Estate Group is your comprehensive resource on Houston residential properties. When it comes to one of the biggest buying decisions you will ever make, Hunter Real Estate Group is here to make it easy for you. 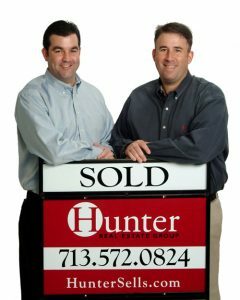 Hunter’s agents have accumulated many years of experience in the area, making them experts on Houston neighborhoods as well as a valuable source of service providers. If you want to lease a home, take advantage of Team Hunter’s extensive knowledge of apartment communities in all price ranges. They have been locating apartments in the area for over 25 years. If you want to buy a home, whether it is an apartment, townhome, loft, single-family residence, duplex or condominium, Team Hunter will help you find the right one. If you want to sell your home, Team Hunter uses comparative marketing analyses to make sure your property is priced correctly. You will not be disappointed by their agents’ earnest dedication to showing and selling your home. Their goal is for your home to sell as soon as possible, with a profit margin you can be happy with. Let Hunter Real Estate Group deal with mortgage brokers, inspectors and title companies so that you can focus on what matters – deciding on a home that suits your lifestyle in a community that shares your values. Work with a firm that consistently finishes in the top 10% of all real estate teams in Houston. With more than six decades of combined professional experience, Hunter’s multimillion dollar producers use a combination of traditional real estate methods and internet technology to help guide your decisions. Stay up to date on the newest listings that fit your criteria with Hunter’s automated email service. Utilize their exhaustive interactive search websites, which are helpful tools for anyone in the market for real estate. Rely on their suite of services including making an offer and responding to counteroffers, reviewing real estate contracts and analyzing the market. Hunter’s commitment to clients goes beyond closing – they also see to it that their clients transition seamlessly into their new homes and lives. Hunter makes sure everything works to your advantage. They offer flexible listing agreement terms and flexible commissions to give you maximum returns. Leverage their expertise on contract negotiations to ensure that transactions work out in your favor. Hunter assists everyone from first-time home buyers and renters to seasoned property investors. For more information, call 713-572-0824 or email welcome@hunterrealestategroup.com.